Biggest Surprise for NASCAR Drivers After Atlanta Race? While the Folds of Honor QuikTrip 500 race at Atlanta Motor Speedway may have been the first test of the new low downforce rules package, the biggest surprise for many of the NASCAR drivers who competed may just have been the ‘big one’ that occurred on the very last lap. The wreck, which occurred on the backstretch during overtime, drew the yellow flag that ended the race and crowned Jimmie Johnson the winner. The driver with the most damage from the Atlanta ‘big one’ was Aric Almirola. His famed Richard Petty Motorsports No. 43 Smithfield Ford caught fire and literally burned up the entire back end of his race car. 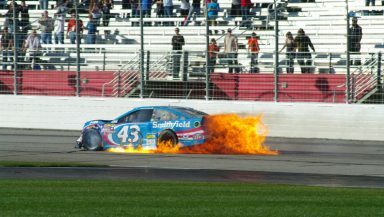 Almirola was able to exit the car with the help of some of the NASCAR and fire officials. He was treated and released from the infield care center. In spite of the melee, Almirola still was able to finish in the 15th position due to the limited number of race cars on the lead lap. David Ragan, driver of the No. 23 Dr. Pepper Toyota for BK Racing was also involved in the crash. He too was treated and released from the infield care center and finished in the 32nd spot. One of sports’ more promising rookies also fell victim to that cursed ‘big one.’ Ryan Blaney, driver of the Woods Brother No. 21 Motorcraft/Quick Lane Racing team, went from 16th to 25th as a result of the late race carnage. The final driver to get caught up in the so-called ‘big one’ was Landon Cassill, driver of the No. 38 FR8 Auctions Ford. Cassill managed a 36th place finish in spite of the crashing all around him. One driver that just barely missed the last-lap wreck was Danica Patrick. The driver of the Stewart-Haas Racing No. 10 Aspen Dental Chevrolet scored a top-20 finish when the checkered flag flew. Whether being a part of the race’s only wreck or just making it through, the biggest surprise for the NASCAR elite at Atlanta was no doubt the ‘big one’, especially during the waning laps of the race.